This cave has a transverse rectangular layout (17x7.9m) and a vaulted roof. The interior looks like a big coffin (Figure 1) because its main theme is the Buddha’s nirvana (his demise; the liberation from existence). Because of the special shape of this cave, it has no trapezoidal top. 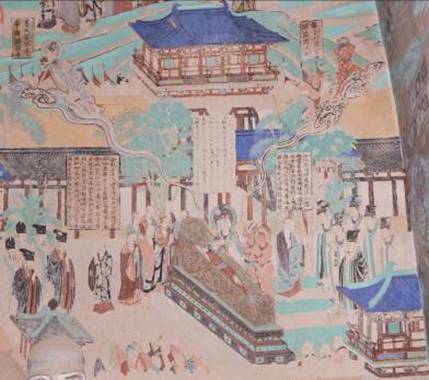 The Thousand-Buddha motif is painted on the flat and rectangular ceiling. This motif is original, yet the colours are still as bright as new. On the long altar in front of the west wall is a giant reclining Buddha made of stucco on a sandstone frame. It is 14.4m long, signifying the Mahaparinirvana (the great completed nirvana). More than 72 stucco statues of his followers, restored in the Qing, surround him in mourning. The Buddha is lying on his right, which is one of the standard sleeping poses of a monk or nun. His right arm is under his head and above the pillow (his folded robe). This statue was later repaired, but the ridged folds of his robe still retain the traits of High Tang art. There is a niche in each of the north and south walls, although the original statues inside were lost. The present ones were moved from somewhere else. Figure 2: The funeral procession, west wall. On the west wall, behind the altar, is the beautifully untouched jingbian, illustrations of narratives from the Nirvana Sutra. The scenes are painted from south to north, and occupy the south, west and north walls with a total area of 2.5x23m. The complete painting consists of ten sections and 66 scenes with inscriptions in each; it includes more than 500 images of humans and animals. The inscriptions explaining the scenes are still legible. The writings in ink read from top to bottom and from left to right, which is unconventional. However, the inscription written in the Qing dynasty on the city wall in one of the scenes is written from top to bottom and from right to left, the same as conventional Chinese writing. Both of these writing styles are popular in Dunhuang. 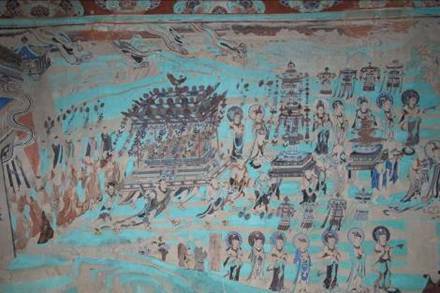 This is the largest and best painting about Nirvana in Dunhuang. In the seventh section (Figure 2), the funeral procession is leaving town on the way to Buddha’s cremation. The casket in the hearse, the stupa and other offerings, which are carried by several dharma protectors in front, are elaborately decorated. The procession, including Bodhisattvas, priests and kings carrying banners and offerings, is solemn and grand. In the ninth section (Figure 3), Indra (one of the gods) is depicted in two continuing scenes. In the first, he stands beside the casket and is removing Buddha’s teeth. In the next, he travels on a cloud to bring the teeth back to heaven to be worshipped (top-left). On the other side (top-right), two asuras (a kind of celestial being) are escaping on a cloud after stealing two of the Buddha’s teeth. The contents of the painting are substantial and the depictions are very detailed and magnificent. The architecture and costumes in this mural are of Chinese style. Interestingly, a rooster is on top of the casket, which is a typical Chinese funeral custom for dispelling evil spirits. 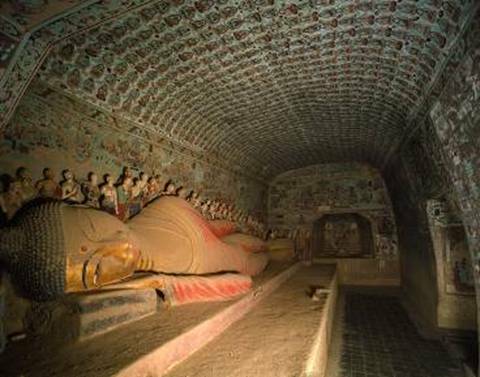 In Dunhuang, mural content with Vajrayana (the last phase of Indian Buddhism) first appears in the Sui caves. Vajrayana flourished in High Tang, thus it is called the Tang-mi (literally, the Vajrayana in the Tang dynasty). In this cave were the earliest examples of Vajrayana art in Dunhuang. It includes jingbian on the thousand-armed and thousand-eyed Guan-yin (Avalokitesvara) on the east wall above the entrance, and statues of his other forms — Amoghapasa in the north niche and Cintamanichakra in the south niche. Although the two original statues are now missing (the present ones were made in the Qing), the content of this cave is recorded on a stele, built in 776 or earlier, in the antechamber. Also in the antechamber are two devaraja (Heavenly Kings), two vajrapani (dharma protectors) and two lions made in Middle Tang and restored in the Qing. On the east wall, at each side of the entrance, other jingbian are painted — Amitabha is on the south side while the Medicine Buddha is on the north. Both of them have vertical margins on both sides to provide additional information on the sutra. They were painted in the High Tang and partly altered in the Western Xia. The magnificent depictions still represent Tang art. The main halls, corner buildings, cloisters, pavilions on water, etc. provide very good information on Tang architecture (Figure 4). In the corridor is the illustration of the Sutra of Requiting Blessing Received, which emphasizes filial piety and is believed to be written by the Chinese to conform with Confucius’ teachings. 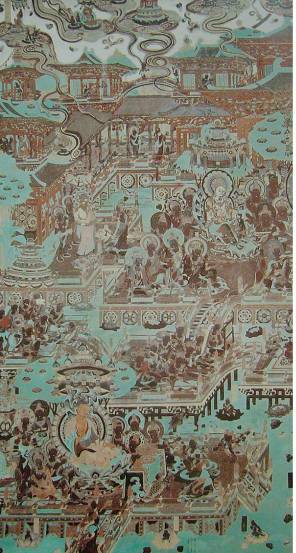 This is the first time the sutra is illustrated in Dunhuang.